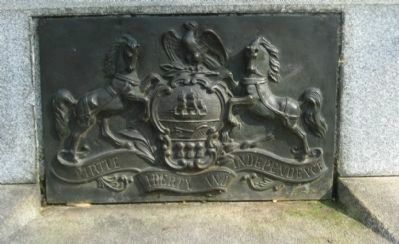 Each side of the monument displays the trefoil of the Second Corps above the inscription panels. July 2. About 5 p.m. the regiment deployed with the Brigade on the northerly side of, and charged through, the Wheatfield, driving the enemy, and continuing the advance to this position, holding it until ordered to retire. July 3. In position with Division on left centre, carried into action 135 officers and men. Recruited in the counties of Montgomery, Chester, Huntingdon, Blair, Centre, Clearfield, Union, Carbon, Luzerne, Potter, Juniata, Northumberland, and Westmoreland. Mustered in, November 7, 1881. Mustered out, June 30, 1865. 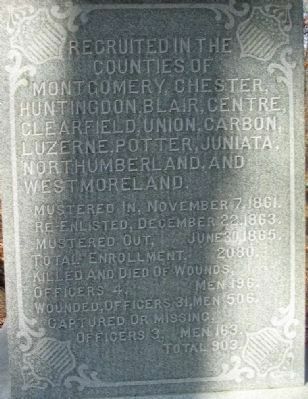 Killed and died of wounds, officers 4, men 196. Wounded, officers 31, men 506. Captured or missing, officers 3. Men 163. 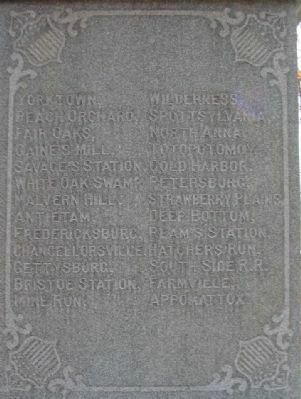 Britstoe Station, Mine Run, Wilderness, Spottsylvania, North Anna, Totopotomy, Cold Harbor, Petersburg, Strawberry Plains, Deep Bottom, Reams' Station, Hatcher's Run, South Side R.R., Farmville, Appomattox. Location. 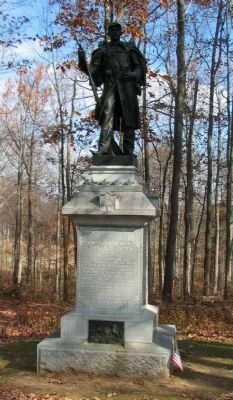 39° 47.711′ N, 77° 14.819′ W. Marker is near Gettysburg, Pennsylvania, in Adams County. Marker is on Brooke Avenue, on the right when traveling north. Touch for map. 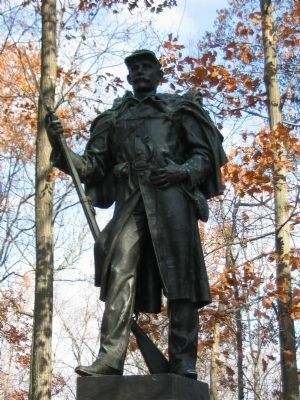 Located in the Rose Woods in Gettysburg National Military Park. Marker is in this post office area: Gettysburg PA 17325, United States of America. Touch for directions. Other nearby markers. At least 8 other markers are within walking distance of this marker. Fourth Brigade (a few steps from this marker); 27th Regiment Connecticut Volunteers Position (a few steps from this marker); Semmes's Brigade (a few steps from this marker); 27th Connecticut Infantry (a few steps from this marker); 64th New York Infantry (a few steps from this marker); 2nd Regiment Delaware Infantry (within shouting distance of this marker); 145th Pennsylvania Infantry (within shouting distance of this marker); Kershaw's Brigade (within shouting distance of this marker). Touch for a list and map of all markers in Gettysburg. The soldier is depicted in his winter uniform with overcoat. Looking at the monument from across the road. The left flank marker stone stands beside Brooke's Brigade tablet on the right. The right flank stone is on the left in this view. 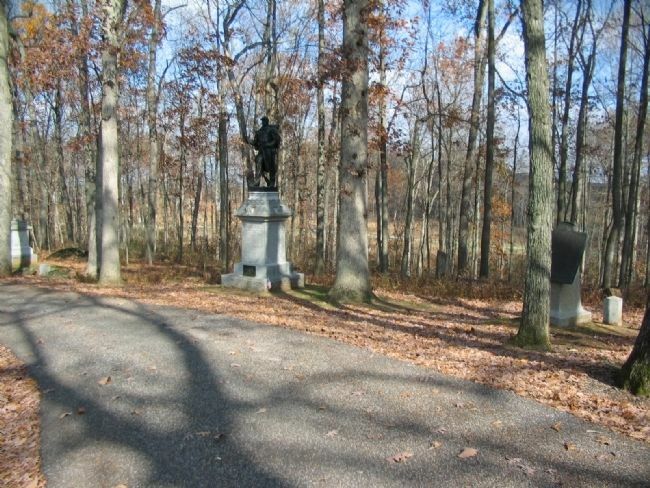 Note how the ground slopes down to Rose Run behind the monument. The slope and rocky outcroppings afforded the 53rd and other elements in Brooke's Brigade a natural defensive position. Unfortunately its flanks were unprotected. More. 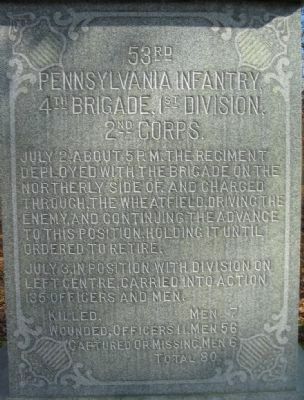 Search the internet for 53rd Pennsylvania Infantry. Credits. This page was last revised on June 16, 2016. This page originally submitted on January 26, 2009, by Craig Swain of Leesburg, Virginia. This page has been viewed 1,081 times since then and 6 times this year. Photos: 1, 2, 3, 4, 5, 6, 7. submitted on January 26, 2009, by Craig Swain of Leesburg, Virginia.